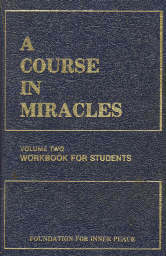 [page 263] "Cure" is a word that cannot be applied to any remedy theworld accepts as beneficial. What the world perceives as therapeutic is but what will make the body "better." When it tries to heal the mind, it sees no separation from the body, where it thinks the mind exists. Its forms of healing thus must substitute illusion for illusion. One belief in sickness takes another form, and so the patient now perceives himself as well.